Lightweight? Check. Capable? Check. Comfortable? Check. Kid approved? Check, check, check. 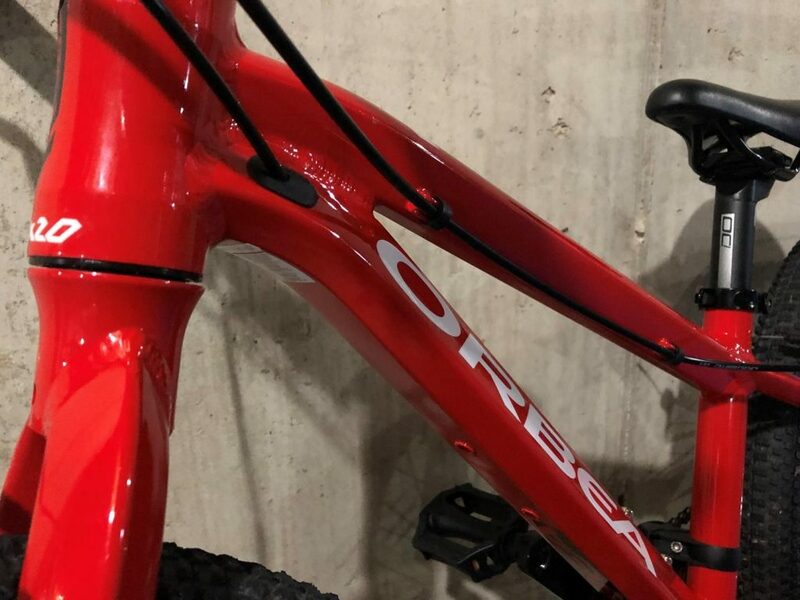 The Orbea MX 20 also just happens to be red (other colors are available) which, for my six-year-old, means everything. After reading enough 20-inch bike reviews to make my head spin like a cassette, it seems that we (Mom and Dad) sweat the small stuff when looking at the specs of a rig. But when the rubber meets the dirt, we all just want a bike that our kid is going to love to ride. The Orbea MX 20 Team checks the “all I want to do is ride my bike” box, but don’t worry, it checks a whole bunch of other ones as well. Now that your pup has shifted into geared bike territory, it seems that the options are endless and more confusing than ever. Fork choice? Hardtail or squishy rear? Trigger or twist grip shifter? As crazy as it sounds, we purchased this red whip using the same approach we took when we bought our first house; we focused on needs instead of wants. Of course, having a carbon frame, tubeless wheels, and the lightest components would be awesome, but unless your kid hits up a few Strava segments on the way to the neighborhood park, they probably aren’t must-haves. 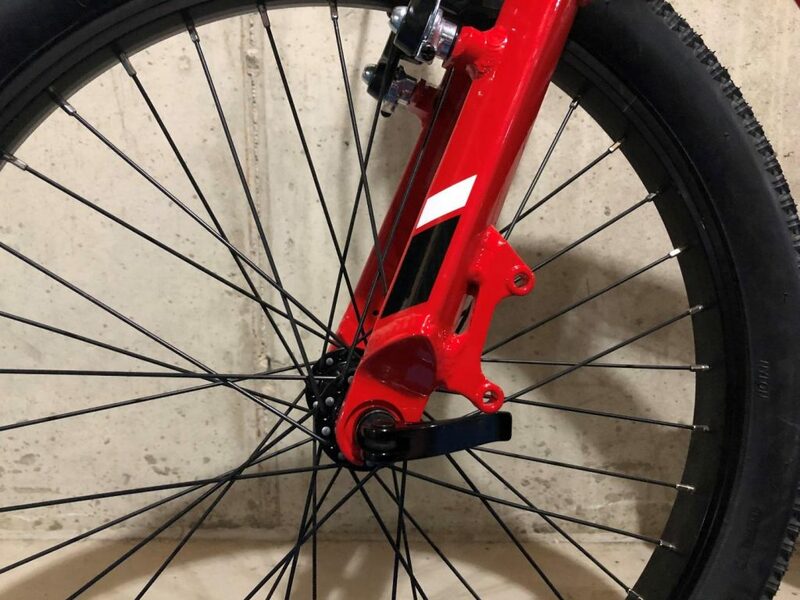 Besides, I’m still trying to get my son to remember to lay his bike down “money side up” to avoid bending the derailleur or scratching the frame. For our son, we wanted him to have a bike that would be fun to ride, easy enough to maintain (mechanical rim brakes), allow for skill development, have a decent spec sheet to ensure we wouldn’t need to upgrade until “necessary,” and last (but certainly not least), be affordable knowing another bike would be a year or two away. The Orbea turned out to be the perfect bike. Get used to hearing, “Hey sweet bike!” when cruising around the neighborhood, path, or bike trail. The frame on the Orbea MX 20 is stunning to say the least. Instead of a classic round tube design, Orbea decided to take a diamond-like approach when molding the frame. The brand is known for its beautiful frames and it was great to see them not skimp when designing their line-up for kid bikes. The MX 20 has clean lines from front to rear and the internal cabling adds a nice feature that is usually only found on higher end adult bikes. Only the rear derailleur cabling is internally routed however. The rear and front brake cables remain clipped neatly to the frame. Not a deal breaker by any means, but when looking at the pictures online which show the drive side (the side with the chain) only, one assumes they both enter the frame. Some shoppers may opt for a suspension fork for their child’s 20 inch, but we felt pretty comfortable with our son still riding a rigid fork. 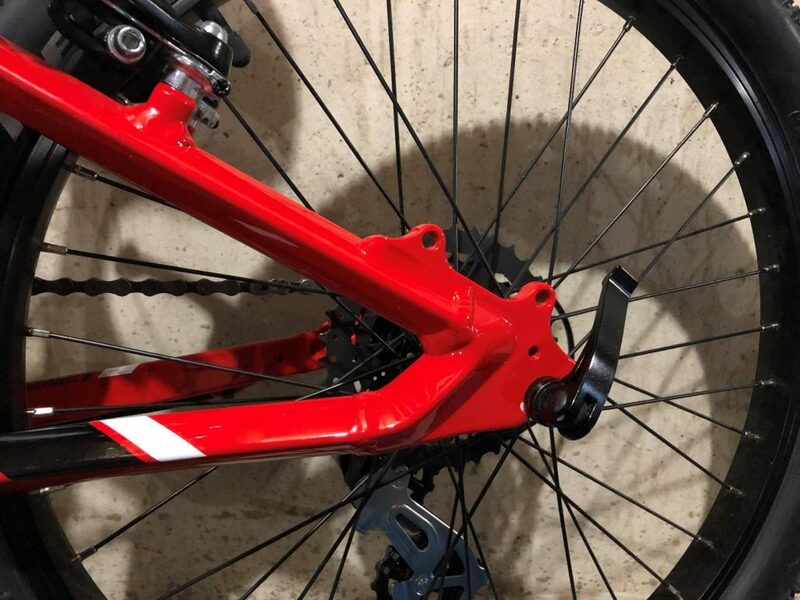 We did our research and many owners commented that a great number of the suspension forks slapped onto kid bikes are heavy and not “tuned” for kids. My six-year-old can barely finish a bowl of cereal, let alone preload a fork to hop over an obstacle. 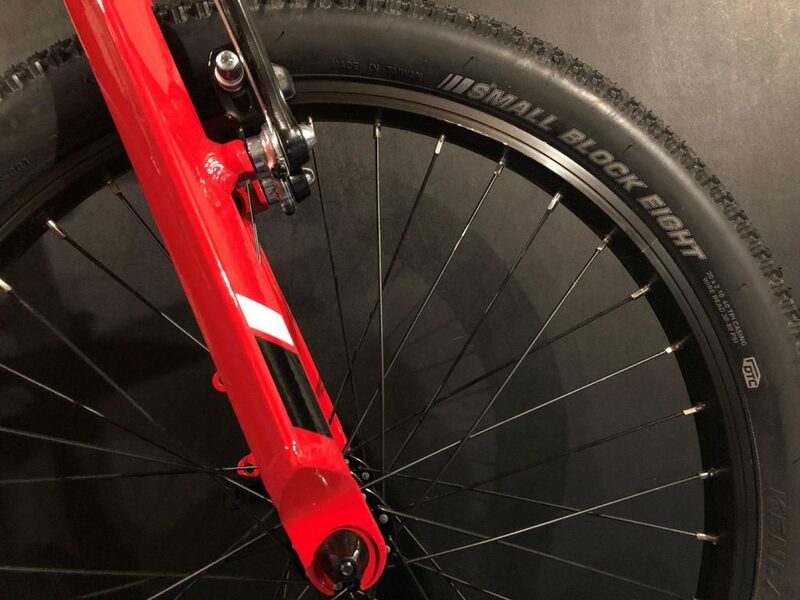 The rigid fork was another way to help keep weight to a minimum and for those that are on the fence about it, you could always upgrade to a suspension fork of your choice in the future. 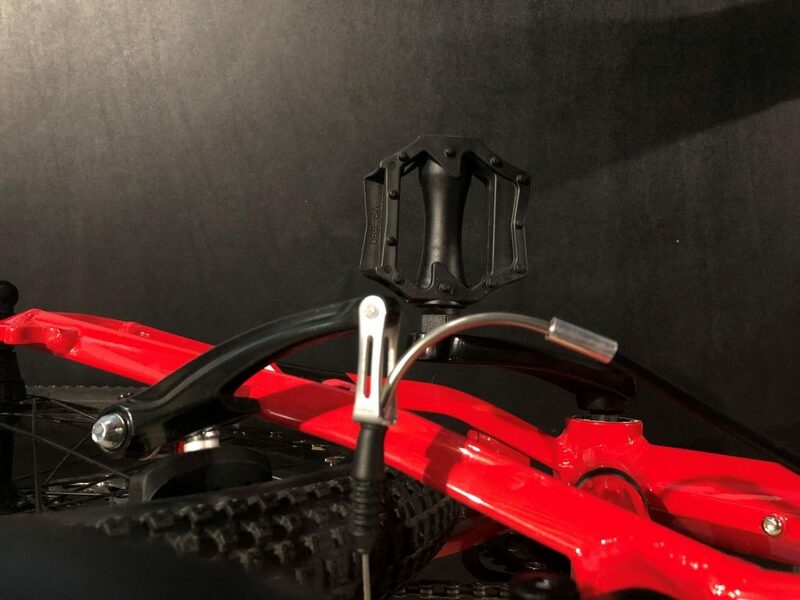 Depending upon the type of riding your child does the majority of the time (mostly singletrack for example), a suspension fork might be a must. For others, drop the psi in the tires a bit and that will suit most riders just fine with the stock fork. The Orbea MX 20 comes equipped with a Shimano trigger shifter, rear cassette and derailleur. All other parts are Orbea’s own which are not the top of the line but work well enough and we have yet to have any hiccups. 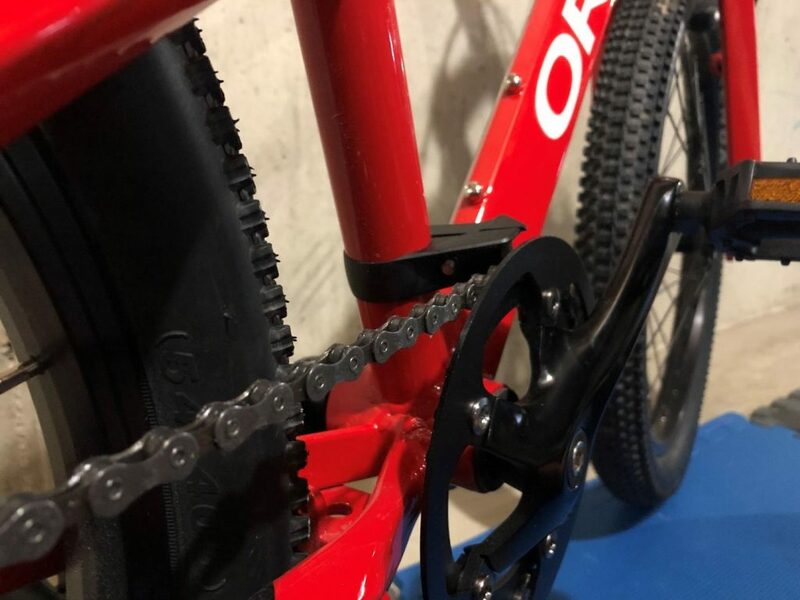 The bike does come with a 34-tooth front chainring which is larger than others in the 20” category, but unless you are riding up super steep terrain, the 34-tooth cassette in the rear will suit your rider just fine. The drivetrain runs beautifully and shifting is precise and predictable. There is even a front chainguide installed to keep the chain in place when going over bumpy terrain. 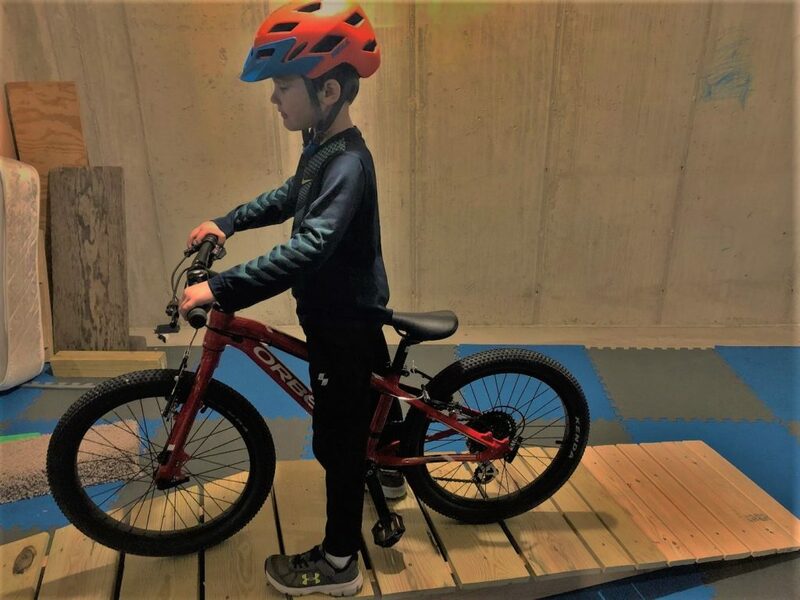 A difficult decision for many is whether to purchase a bike with a twist grip shifter or a trigger shifter taking into account this may be their child’s first geared bike. The complexity of pedaling, changing gears, and not crashing at the same time did cross our minds in the beginning, but with a little bit of creativity, within a ride or two, our son had the hang of it. We settled with a simple “finger back harder and thumb push easier” command instead of “shift up or shift down.” A trigger is the way to go for sure. For riders with smaller hands and digits, pushing and pulling the triggers may be difficult at first, but they’ll overcome that hurdle quite quickly. One other thing that is worth mentioning, although it may not be a concern to many, is how low the rear derailleur cage hangs. For most of the trails we ride, the proximity to the ground has not resulted in any contact. To be fair, there is only so much room when you’re dealing with a 20-inch bike frame, so you can’t really fault Orbea for this. If your child is going to be ripping through rocky terrain or bouncing off of “baby heads” (don’t get mad at me…it’s just what people call small, round shaped rocks in a rock garden), it might be something to take into consideration. Last but not least on the spec list that had us scratching our heads was whether we should go with disc brakes or rim brakes. The trails in the Midwest are quick to close down when wet, so riding in mud, rain, or any kind of inclement weather isn’t a concern for us. The Orbea Alu v-brakes that come standard on the bike work just fine. 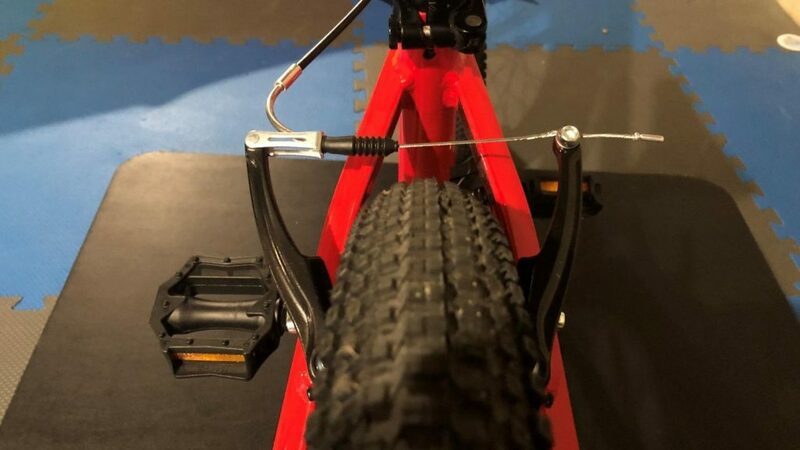 The reach adjustment is easy to modify with an Allen wrench for smaller hands and the levers seem to provide plenty of stopping power for our son whether on the trail or on the path. He has not ridden a bike with hydraulic disc brakes, but weighing in at about 45 pounds dripping wet, I’m not quite sure how much stopping power the brakes really need to have. The only caveat of course is for those riders who ride dusty trails, wet trails, or are looking for the braking confidence that discs bring with them. If that is the case…no worries, the frame is already equipped with mounts if you wanted to bolt on some disc brakes later (disc compatible wheels would be needed also). 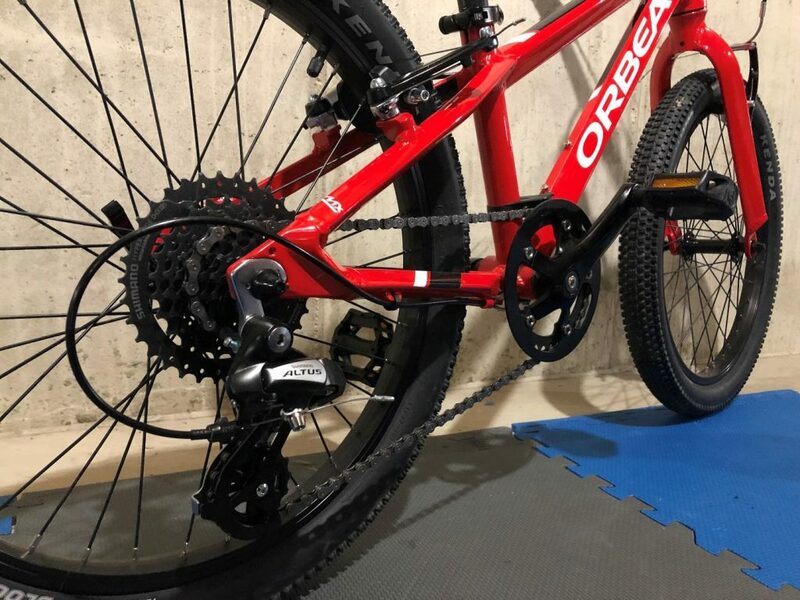 Editors note: If disc brakes are important to you, Orbea also offers the “MX 20 Team Disc.” Basically the same bike but with Shimano M396 hydraulic disc brakes. The only issue we have had with the v-brakes thus far is just how far they stick out. Our son wears a boys’ size one shoe and there is not a great deal of room between his shoe and the rear brake caliper. Our initial reasoning behind this is the massive brake pad that comes with the setup. The large pad forces the calipers to be angled out at such an angle so the pad makes the proper contact with the brake track. If buyers find this to be an issue, installing a thinner brake pad is a five-minute fix and probably will cost less than 10 bucks. Sizing our kids up for a bike is like playing darts blindfolded. 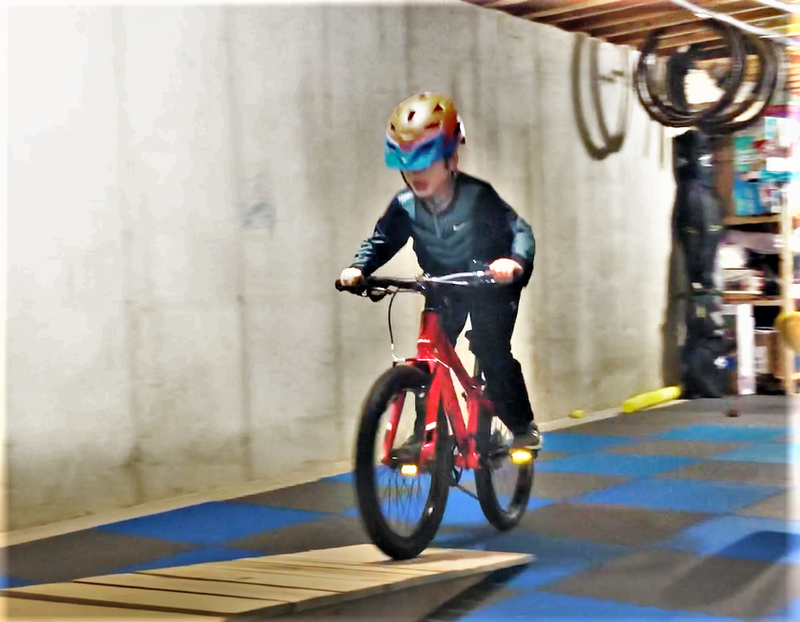 With many 16-inch bikes lacking gears, beafier tires and suspension, many parents are chomping at the bit to get their kid on a 20-inch ride. That brings along some potential negatives though. Weight? Our son went from a Woom 3 to the Orbea and we could physically see the difference when he took off from a standing start, but after that, we felt that the extra lbs. kept him more stable at higher speeds and when going over rougher terrain. And, once he figured out which gear was best for launching off the line, the extra weight was no longer an issue. Fit? We have seen some six-year-olds who were pedaling on their tippy toes and could barely reach the brakes. That is not the case with the Orbea MX 20. 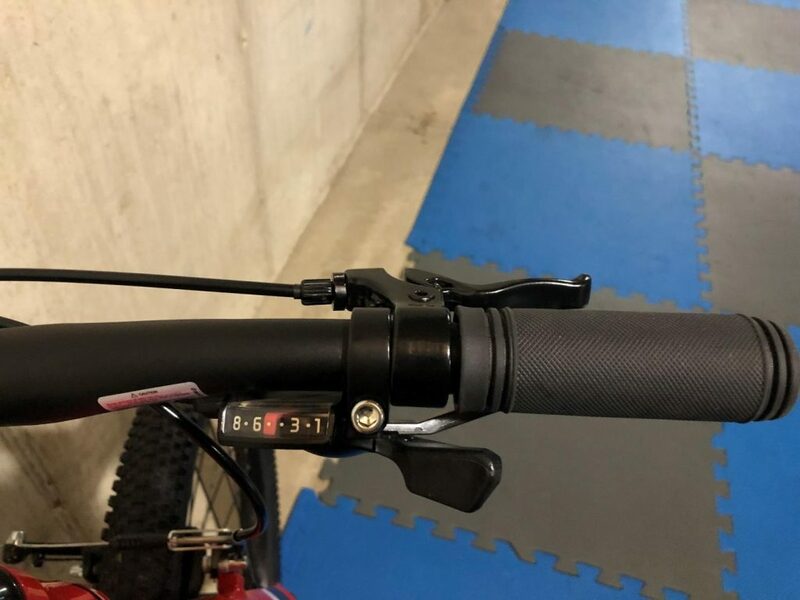 As mentioned above, the brake levers can easily be adjusted for smaller hands and the stem and handlebars are just the right length and width to accommodate riders of all sizes. The stand over height is only 533 mm so it should not be an issue for most kids. The overall fit and feel of the frame has been great. The reach is not too upright nor too aggressive which will surely keep your son or daughter comfortable regardless of the number of miles they put in. Our 6-year old son in the picture is 49 inches tall. 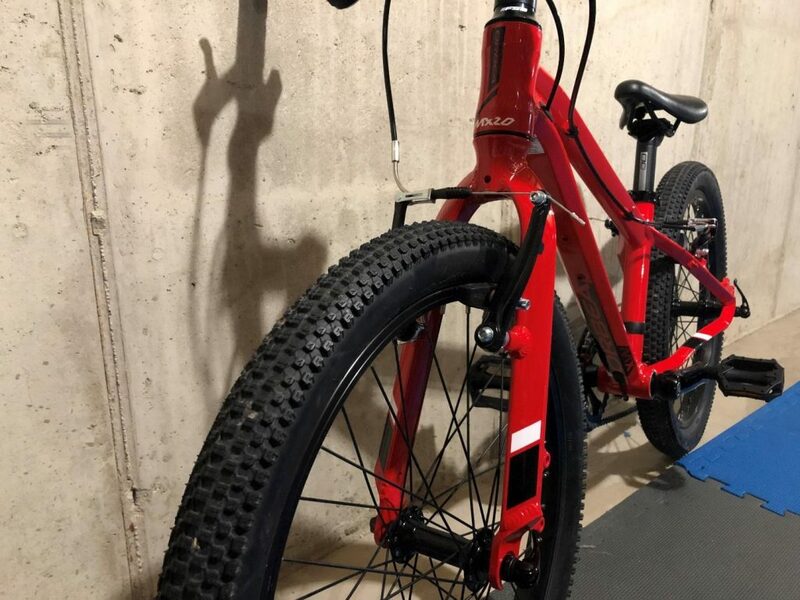 Depending upon the size of your son or daughter, you may be tempted to jump up to a 24-inch bike and skip the 20 altogether. Yes, you will get another year, two years, or even more out of the purchase, but at what cost? If you ride on a medium frame, next time you hit the trails, jump on your buddy’s XL. Notice any differences? Now imagine you don’t have 20 years of riding experience under your belt. Your son or daughter will want to continue riding their bike as long as they enjoy riding their bike. The fit, feel, and confidence they get from their ride is important. Some may assume there are more options to choose from in the 24-inch line, but I believe that was only true ten years ago. There are plenty of brands that have committed to building great bikes for kids, so don’t be in a rush to skip a chapter in your child’s bike line-up. Since others in the neighborhood are going to want to ride this rig, you can breathe a sigh of relief to know that the seat post has some nice etching on it so you can adjust it back to the height it was at when it first left your garage. 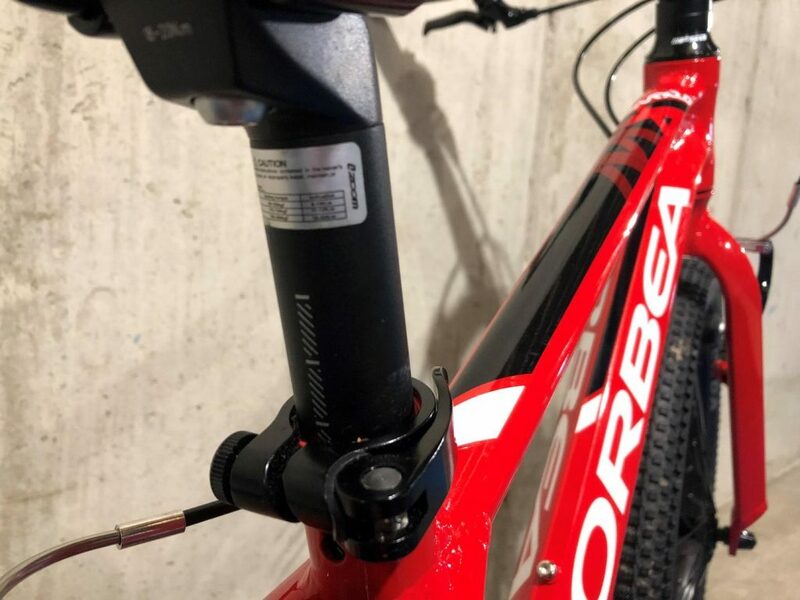 The Orbea comes equipped with a quick release/clamp for the seat tube which comes in handy when you don’t want to dig out the Allen wrenches every time you have to make a small adjustment. The only gripe we have had with the seat is that it is not adjustable. Any fore/aft or angling adjustment is not possible with the stock seat and seatpost. One could upgrade it if necessary, but since no two “rears” are the same, it may be an issue for some while others will be “sitting pretty” with the stock setup. Unless you live down the street from the bike park, bike path, or nearest stretch of singletrack, your kid (more likely you) will have to pick up the bike quite often. With our hitch rack not being suitable for a 20-inch bike, the Orbea ends up in the back of the car. Not a problem. With a weight of 21 lbs. (according to my scale), it is light enough to transport, pick up after a crash, and carry up and down the basement stairs multiple times a day (our kids ride laps in the basement during the winter). Although there are bikes out there that are lighter than the MX 20, the small weight penalty should not be a deal breaker. As I mentioned earlier, your son or daughter may have a bit of lag off the line, but the extra pound or two isn’t going to be felt as much as you might think. For those of us that don’t typically end up on the podium at the xc race, I’m not quite sure we can use the “well if only my bike was one-pound lighter” excuse. If money is of no concern, then surely you can go for a different bike and build to lighten things up, but in all honesty, this is probably a 2-year bike not a forever bike. 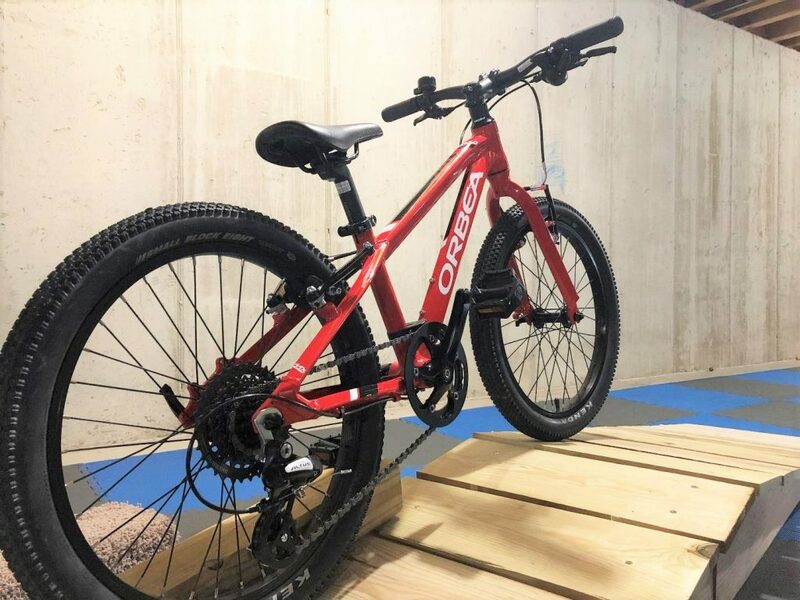 The Orbea MX 20 should definitely be entered on your short list when shopping for a 20-inch mountain bike. The roster of quality bikes keeps growing from year to year and kids and parents should be grateful that manufacturers are giving some attention to the lil’ guys and girls. There is always going to be other bikes that have a better this or a better that, but I think we would all agree, we just want our kids to love riding bikes. Most of us have memories of our bike rides when we were kids and we enjoyed them regardless of the components we had on our bike. Except for maybe a few riders, this will be a tremendous step up from the bike most youngsters are currently riding. Orbea has done a great job designing and building the MX 20. Any parent will appreciate the affordability, the quality, and most of all, the joy their child gets from riding it. Not sold yet on the Orbea MX 20? Or what to see how it compares to other bikes in this size range? Check out these articles to help you choose. My name is Michael Pero, a 38 year old teacher, husband and father of two boys, ages 6 and 4. When not building forts, bike ramps, or exploring the great outdoors on two feet, you’ll find me racing on two wheels. With two junior Olympic xc racers in training, I know there are many more smiles and miles in my future.